Gutter Guard Sydney – Gutter Knight is your local family owned Gutter Guard company. We service the greater Sydney region and can assist you in all of your Gutter protection requirements. Being a family owned company we also understand what is important to you when it comes to protecting your home from leaves and debris. This is why we only use premium locally manufactured products that are designed specifically for Australian conditions, give WRITTEN (not verbal) 12 year product and 20 year Workmanship warranty certificates, are fully insured and licensed and all our installers are fully trained and safety compliant. All of this is to ensure you have the peace of mind in knowing that your Gutter Guard installation will be done correctly the first time and to the high standard that you and your family deserve. From the time you contact us we will treat you with respect and professionalism, make a time that suits you to drop by and measure your home, arrive on time and provide you with a detailed written proposal outlining exactly what your Gutter Guard installation will involve. This way you know exactly what you are getting with no confusion. 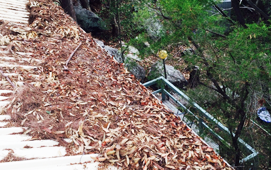 Why choose Sydney Gutter Guard – Gutter Knight? All our gutter guards are manufactured in Brisbane and proudly Australian made. 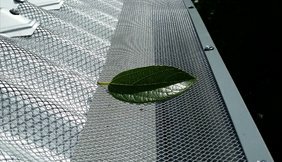 Our gutter guards are either made from high quality aluminium or steel mesh which is powder coated to suit the colour of your roof. The benefit of using either steel or aluminium is the material will last a long time and will still be in great working condition when other inferior products have failed, in fact; Gutter Knight gives you a written warranty that covers the product and also has a 20 year workmanship guarantee for added protection. Prior to installing your new gutter guards, Gutter Knight will make sure your gutters are first all cleaned of debris, leaves and the top of your down pipes are visually inspected for any blockages. 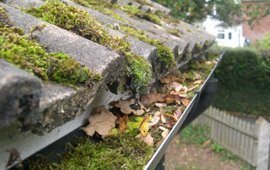 Upon completion we even clean up all our mess then remove it – only leaving you with leaf free gutters.